The GranCabrio will cost about 125,000 euros. 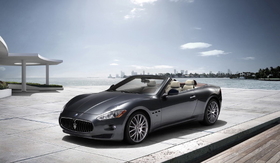 TURIN -- Maserati will debut the GranCabrio, its first four-seater convertible, at the Frankfurt auto show in September. The GranCabrio is a softtop variant of the four-seat GranTurismo. It has a roof that opens or closes in 28 seconds and will go on sale by the end of the year with prices expected to start at 125,000 euros in Europe. The convertible was styled by Italian design house Pininfarina, which also styled the GranTurismo and Quattroporte sedan for the Fiat S.p.A. subsidiary. The GranCabrio is powered by Maserati's 440hp 4.7-liter V-8 engine. Maserati says the GranCabrio's 2940mm wheelbase -- the same size as the GranTurismo -- is the longest in its category, giving more room for rear passengers. The GranCabrio completes the three-car Maserati family with the GranTurismo and Quattroporte sedan. The car will add volume to the company's sales, especially in the crucial U.S. market, which is expected to be the biggest market for the convertible. Maserati's unit sales were down 48.2 percent to 2,326 in the first half, which the company said was in line with a 47 percent decline in the relevant market segment.